Thank you all for your encouragement, effort, contacts, and donations! Where there was no playset, there is now a simple joy for a girl going through so much. This is the reality of what Realtime Church can do when we try to be Christ's hands and feet! Without all of you, this never would have happened. The picture to the right is Kate in the playset on the first night. There is still a little bit of work to be done. In order to maximize Kate's time on the playset before her next round of chemo, we put the playset in before the yard was prepped for it. Some teams still have to do some work before the playset is put in its permanent place. Please keep the remainder of this project in your prayers, and let us know if you have an idea on how you can help. And of course, keep this sweet little girl in your prayers as she still has some fighting left to do. 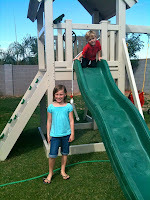 This is the playset the day before Kate got home. The kids are Kate's brother and sister. There are several different projects in different parts of the country that Realtime Church is working on (as of 12-18-09). Due to people's privacy, we can't reveal some of these projects untill the timing is right. Please check back often to see what's up in the RTC world. >>7:40pm- 11/12/09- Amazing news! 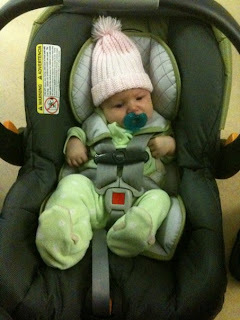 Ellie is headed home! She was released today, and is headed home for some normal life. The family has relayed thanks to the Realtime Church community for all the prayers. The doctors will do some tests in a couple months to see how she is developing. Ellie is a little girl born to Nate and Annie Orosz on Friday the 2nd of October in Columbus, OH. 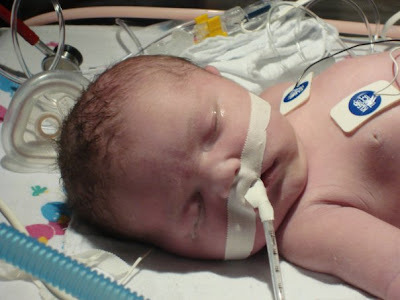 After a normal pregnancy, the umbilical cord ruptured when Annie's water broke. There was significant blood loss and a shortage of blood to Ellie's brain. >>1:38pm- 11/10/09- Good news! Ellie is off all her feeding tubes and breathing tubes. She should be going home in a week or two! 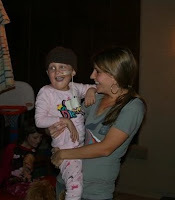 >>5:19pm- 11/1/09- It may be weeks before we know if there has or hasn't been any negative impact on sweet Ellie's brain. Stay tuned and we will post any info we get as soon as we get it. Ellie's mommy and daddy got to hold her for the first time. See the pic! Ellie will be seeing a kidney specialist today. We'll update you as we get more information. Ellie just had a very wet diaper!! Your prayers are working. Please keep on praying for more pee and also for her brain. More info to come. The doctors are still waiting for Ellie to pee. They need her to do this to get rid of the extra swelling. If they cannot get this under control, they may have to look at other options. So, pray for PEE!!! Also, Ellie's parents have family in town who are staying in hotels. They are in the Columbus, Ohio area. Anyone have any connections in this area? E-mail/FB/Twitter RTC. They really need her to pee. 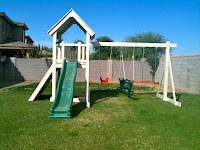 Most of the play set project is in place. There is some work left, so we still need your help! Sod has been donated. In ground sprinkling is going in soon. Companies are donating their time. In the next couple weeks, we should see an amazing finished project where there used to be empty space. one here. Kate's will look similar. Many of you have already read about Kate McRae. If not, click >>RTC<< or caringbridge. This sweet, five-year-old girl from Phoenix was just recently diagnosed with an aggressive brain tumor and is currently finishing her fourth round of chemo. 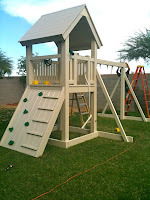 She has recently expressed how much she wants a play set, and we would like to surprise her with one when she gets home. We have been in close contact with Kate's parents, and this is something that they would love to see happen. There is even a specific kind of swing that she likes to use. There is so little that we can do for her other than pray. This doesn't change everything, but it might make life at home a little more enjoyable. Here is a picture of the space that we have to use. We can use the whole dirt area. 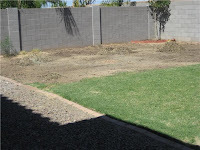 The area is 20' x 30', and in addition to the playset, we need to cover it with sod and sprinkling. We need donations. We are working with a 501(c)3 organization in Grand Rapids called Word Investments Inc. Donations are tax-deductible, and you will get a receipt at the end of the year. 100% of every donation goes directly to the McRaes. We need your help! Lets make this happen right now! This is the least we can do for this amazing family going through such terrible heartache. 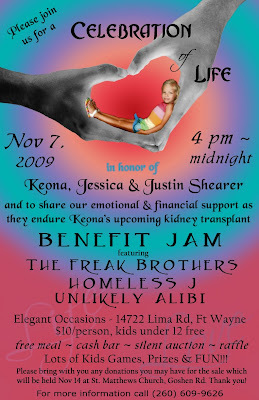 Little 5 year old Keona Shearer has chronic kidney failure. She is in need of a transplant soon. Fortunately, her father, Justin, is going to donate. They just need to do some final testing and schedule the surgery. Jessica, Keona's mom who works two jobs currently, will have to take time off of both to be with Keona after the surgery. Some of their close friends are organizing a benefit dinner/concert and garage sale to help raise money for Jessica to help support her during Keona's recovery. We need your help, and it's not what you might think. We are all about projects. Most of the projects that we are working on right now are from people that we here at RTC already know. We want more projects! We want projects from people we don't know! Do you know someone in a critical situation - serious health issue, house fire, or other tragedy? We might not be able to solve every problem, but when we join forces, we can help a lot of people. What are the crises going on around you? Let us know! When else does somebody want to hear you complain? All of the crap that happens in your life and the lives around you! The Realtime Church community wants to come together to help. But first you have to let us know what critical situations are going on! Please, let us know! We want more projects! So we've been doing Realtime Church for about a month and a half. There are a handful of projects that we've had the privilege to be a part of in the past six weeks. 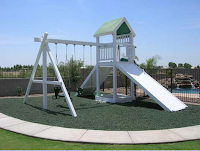 Some are big and dramatic like the playset that we built for Kate MacRae. Some are top-secret and we still won't be able to tell you about them for a couple weeks! But whether it is keeping you up-to-date on a sick little girl like Ellie, or whether it is letting you know about a benefit concert like Keona’s… we are doing just what we work hoped to be doing.